One of the most (if perhaps not the most) treasured tool in my tool chest is my vintage Stanley Bedrock No. 7. I’ve had it for a bit less than year and I love it more and more every day. It was a gift from my late godfather, and it is a joy to use. No idea if the red paint is original. I’m generally familiar with the dating criteria for ordinary Stanley planes. But I hadn’t looked into the history of the Bedrock variants. Until last night. Turns out, my No. 7 is a Type 2, built between 1898-1899. It’s not my oldest tool (that probably goes to the firmer paring chisel I recently restored), but it’s still in great shape for its age. One patent here. One patent on the lateral adjustment lever. Despite hanging on a basement wall for however many decades (it has a hanging hole), the plane had minimal rust (no pitting) and the sole was still very flat. It merely required a wipe down with mineral spirits, a replacement iron (Veritas A2 from Lee Valley), a quick re-peening of the lateral adjustment lever, and a few passes on the granite slab with 220 grit sandpaper to be fully functional. I don’t know how much use it got originally, but it gets used every day I’m in my shop. If it came down to it, I am 100% certain that it’s the only bench plane I would keep. They really don’t make ’em like they used to. And, for the record, I sharpen my No. 7 with a slight camber. I almost never buy tools off eBay. Not used ones, anyway. I usually stick to the “New Old Stock” variety. So it was particularly out of character for me to take a leap of faith on a random Stanley No. 4. The tool in question is almost certainly a Type 17 from 1942-1945. It has a hardwood knob/tote and a steel depth adjustment knob, plus a heavier casting. Its heft feels more like a modern Bedrock copy than a vintage Stanley. I’m willing to bet this plane helped defeat the Nazis. You can really see the thickness of the walls in this shot. The tool was either (i) well-loved and cared for in its former life or (ii) used a little bit and then squirreled away. My vote is for well-loved and cared for. There was a hanging hole in the heel of the sole. All the arrises were carefully broken with a file. The lateral adjustment lever showed signs of re-peening. The depth adjustment knob was caked with sawdust. All the signs of a craftsman’s tool. My only reservation is that the iron seems off. There is just so much steel left. It could be a replacement iron. And the shape of the cutting edge was strange, with a very slight hollow along the width. Not a hollow grind on the bevel. The cutting edge itself had the opposite shape of a smoothing plane camber. If it had been sharp, you could have beaded with the plane when it arrived in the mail. Perhaps the skilled craftsman was two owners ago. Easily fixed in the honing process, though. Also a surprise: the sole was very flat to begin with. It took less than 30 seconds with 120 grit on the granite slab to get it as flat as it ever needs to be. This is not exaggeration. 20 or so passes and it was flatter than most new planes. And the sides were very square to the sole. Another 30 seconds on the granite slab with a squaring block and it was good to go for shooting. Strange place for a hollow. But completely harmless on a smoothing plane. I was pleasantly surprised at every turn. In fact, tuning was going so well, I developed the intention of making this one of my main worker planes. But then, after all the scrubbing and sanding and honing, I moved the frog forward and extended the blade to take a thin shaving and what did I see? Wood. Lots of it. It was like looking under the hood of an old car and seeing asphalt. My heart sank. Tearout will always be a problem with this plane. On a hand plane, the blade, in its cutting motion, lifts under the wood fibers. As I understand it, the leading edge of the mouth presses down on the fibers while the blade cuts. The wider the mouth, the more likely the fibers will lift and split ahead of the blade edge. This is called tearout. On a smoothing plane, you want the narrowest mouth possible. The opening between blade and sole should be barely wider than the shaving taken. A perfectly tuned and set smoothing plane can take a tearout-free shaving in any direction on even the most figured or swirling grain because of this narrow opening. That is, the leading edge of the mouth applies downward pressure so close to the cutting edge that there is no opportunity for fibers to lift and split as the cut progresses. No opportunity for tearout. But with a mouth this size, this particular plane would eat figured food. Literally tear it up and spit it out. So, with a heavy heart, I have put this plane in the reserve bin (i.e., my Craftsman Top Chest). But I will name it James, Jr., for it has a mouth so big that it ruins everything it comes in contact with. 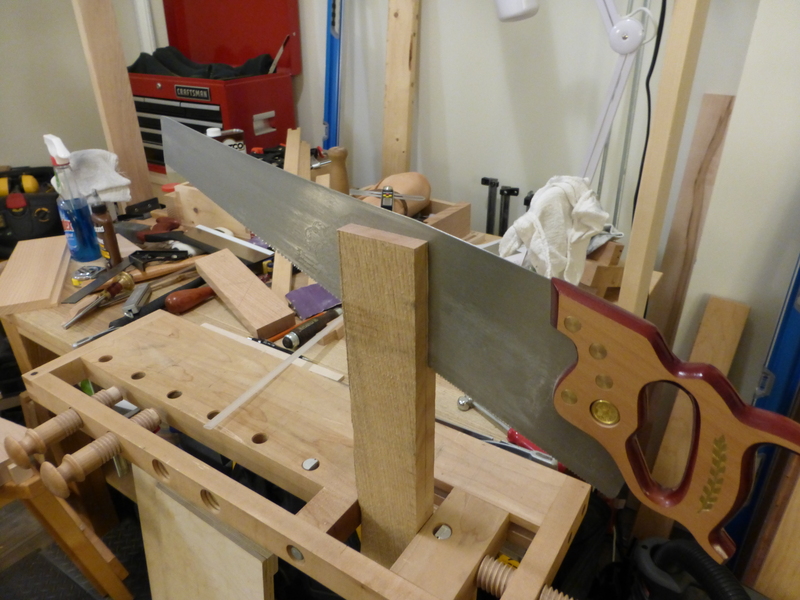 Perhaps it will one day find life as a scrub plane. It certainly has the mouth for heavy shavings. A funny thing happened today when I woke up and went into the shop. Calipers in hand, ready to measure for the plug I was going to make, I decided to give it one more shot. I positioned the holdfast to the left over a scrap of wood, and whacked it with a sledge. Nothing. Undeterred, I gave it another whack, this time holding the shaft steady as I drove it in. It felt like it seated a bit. After a third whack, it felt like it was grabbing. The fourth whack, it set tightly. Hmm. And it works pointed right as well. This is not a political metaphor (yet). I guess the trick is to hold the shaft steady as you drive it in. So, much less sad than yesterday, I bought a corded drill and made a plumb jig to bore the remaining holes (seen above). Much like ‘Murica itself, this drill was assembled here with foreign components. It’s always good to sleep on it. New to me, at least. I’m cleaning up a vintage saw. And ruining my nice ash table in the process. This Simonds saw, a 12ppi crosscut panel saw, came to me through a family friend (a godparent, in fact). The plate was lightly rusted, with little pitting (and none near the teeth). Sandflex hand blocks and some elbow grease quickly led to a passable shine. And the Etch even survived the rust removal process. The plate was slightly breasted along the toothline: unclear to me if the breasting was OEM or a product of uneven filing over time. Made from 1901 to 1926, according to teh interwebs. The handle is also in excellent shape, if slightly paint-caked around the plate. There is some chipping around one of the saw nuts (probably my doing), but otherwise, the finish is consistent and no work was needed. I may ease the top tongue on the handle to fit my hand better, but I’d like to see how it works before I do. No lamb’s tongue, but whatever. The only real problem with the saw was the teeth. One side of the plate, the were filed much smaller than other. My best guess is the crosscut filing was consistently done out of horizontal and without flipping the saw around between sides. So my choices were: (i) file the teeth completely away and start all over or (ii) reshape the saw into a 6+ tpi rip saw. There is a great Paul Sellers tutorial on recutting saw teeth, but a 6+ tpi rip saw will fill a gap in my tool chest. I’m not finished with it yet, but I think reshaping was the right choice. I already own a 10 tpi rip pattern panel raw (which is great for all-around work, including cross-cutting to rough length), but my only other rip pattern panel saw is 4.5 tpi (too coarse in my experience for hardwoods). This saw will almost split the difference and give me a more aggressive option for hardwoods and softwoods alike. And worse comes to worst, I’ll file them flat and start all over again. There is plenty of plate left. Either way, I’m going to need a new 7″ slim file after this. I don’t usually do tool recommendations, but I have been very pleased with my new Warrington Pattern Hammer. It’s nothing special, just a $25 dollar amazon find, but it’s worked well so far. I may have lucked out, but the hammer is well handled and straight, and the balance of the 12oz head feels good in my hand. If you’re looking for a relatively cheap woodworking hammer, you could do worse. 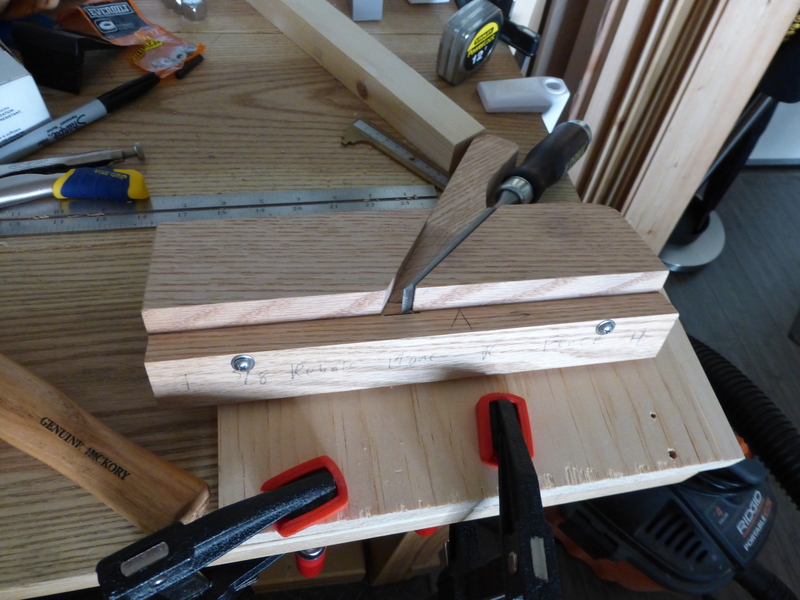 When I deepened the recess on the set of poor man’s rebate planes to accept a 5/8 inch bench chisel, the initial 1/2 inch wedge for the right-hand version became useless. 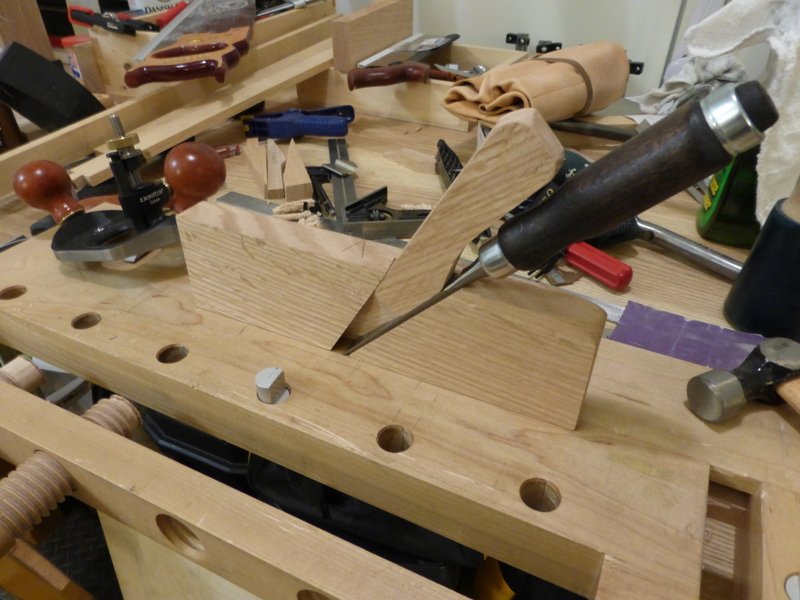 This presented two issues: (a) the bed angle itself was sized against the old wedge, so the new wedge must be custom fit; and (b) there had to be an easier way to get the correct bevel than just starting from a four square blank and planing down. In addition, there was the problem of not having any 5/8 stock, but I fortunately had enough remaining quarter-sawn red oak to resaw some wedge blanks. 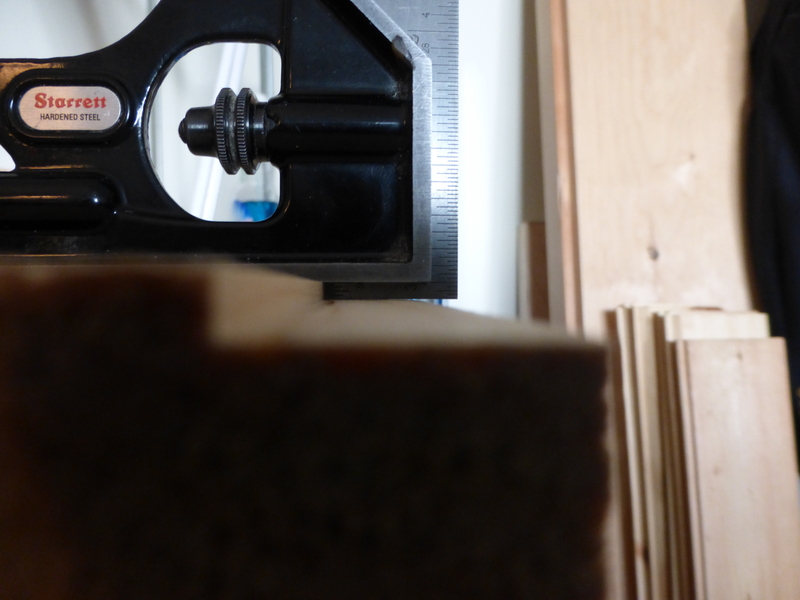 Plus, the waste from the resaw, at just over 1/2 thick, is probably usable for something else. Taking my time, as there is little margin for error. The initial recess was marked against a 1:4.5 angled wedge (as recommended in the Paul Seller’s video), but after all the trimming and refinement of the bed, I think it’s now closer to 1:4. Also, I tried marking the actual bevel angle directly on the blank and rip down along that bevel. This gave me matching right and left wedges (for the matching right-hand and left-hand planes) that need less work overall in refining the fit. Perfect fit! Now to make the fence. I’m excited to finish up the fence and put the right-hand plane to work (after I figure out the best way to attach the scoring spur). I might even buy a second 5/8 inch Narex chisel so I don’t need to swap back and forth once the left-hand plane is done, but we’ll see. Here’s hoping using quarter-sawn hardwood will increase the longevity of the planes. All in all, it’s been a good exercise, and very enjoyable learning basic plane-making. I’m certain the left-hand version will come out even better than the right.